The meme quickly went viral and has now been retweeted almost 20,000 times. With the official Trump/Pence logo and the “Make America Great Again” slogan also included on the meme, Trump supporters proudly shared it out of support for the campaign’s position on immigration. 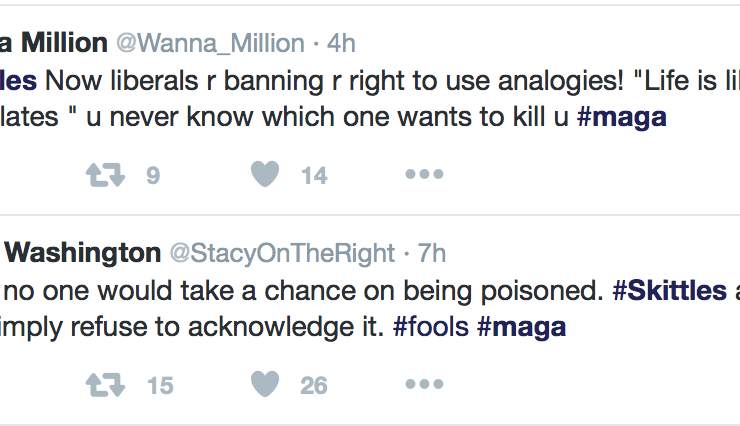 They also defended the analogy and doubled down on the belief that nobody would really want to take the risk of being poisoned. Former congressman turned radio host, Joe Walsh, even reminded Trump Jr. that he had made that point a month ago. But on the other side of the Skittle, people were outraged that a comparison had been made between a candy and a person. The anti-Trump crowd has long fought against the heated rhetoric of the damage that can be done when the U.S. accepts refugees. Jon Favreau, a former chief speech writer for Obama, put a child’s face on Twitter instead of a bowl of candy to make his argument. Other people took the time to create their own analogies and memes, reiterate that these refugees are fleeing oppression and war, and some brought a little levity to the debacle by sending thoughts and prayers to the poor social media intern in charge of the @Skittles handle. A moment of silence for the poor @Skittles social media intern stuck in the aftermath of Trump idiocy. You hang in there Skittlesperson. The odds of being killed by a refugee in a terrorist attack are about 1 in more than 3.6 billion, according to a recent Cato Institute study. We don’t know the odds of another candy analogy being brought into this year’s election, but we’re open to your guesses. Also let us know if you thought Donald Trump Jr.’s Skittles meme was Funny or Offensive. Tell the world how you feel! Is it FOO? - Vote now! As the area of our knowledge grows, so too does the perimeter of our ignorance.